How can I unshare a pipeline after I've gone over the box limit on a free plan? Locked out of your pipeline? Look here for tips. 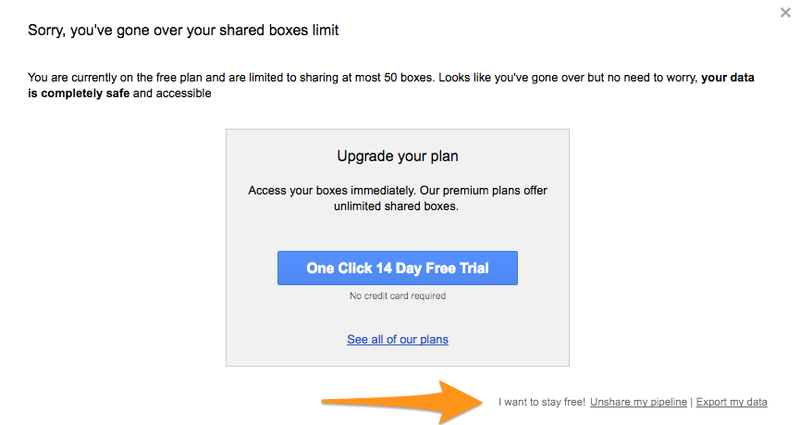 This means you’re on the free Streak Personal Plan and you’ve exceeded 50 Boxes in a Pipeline – simply go into the Pipeline and unshare it so that only one person has access to it (private pipelines can have unlimited Boxes). To unshare your Pipeline, click the "Unshare" link at the bottom of the popup as displayed below. If you are not the Admin of this Pipeline, you will have to ask the Admin to unshare the Pipeline. Removing a user from a Pipeline will not affect any of the data (comments, Boxes created, etc) created by that user. Users who are removed from a Pipeline will be unassigned from all Boxes in that Pipeline, however.